For the longest time that there had been recorded arguments of countries and states on which came first, and which came last, who owns this and who owns that and who started it all and who ended it well. the humble state of San Marino will not let others outshined itself. it has been claimed that this pocket-sized country entails the oldest constitution that is still taking effect. The Constitution of San Marino is the oldest existing constitution in the world, for a sovereign state. 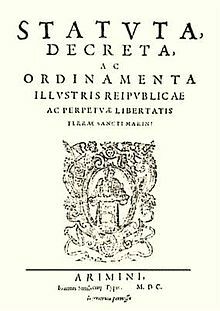 Enacted on october 8, 1600, it is basically distributed over a number of legislative instruments and the declaration on Human Rights. The constitutional system was influenced by the Corpus Juris Civilis and Roman customary law. It is also in the constitution where the discussion and interpretation of various councils of San Marino, Courts, administrative positions, can be fond. And did you know that the San Marino constitution also includes a proper interpretation of the provisions and how it must be altered and promulgated.